Donnie Cianciotto never thought of himself as an activist. Instead, the founding direction of Musical Mayhem, has always been about theater and music. Cianciotto is a born entertainer, but then Caitlyn Jenner entered the scene and thus a Tucson transgender activist was born. While musical theater remains Cianciotto’s life and work, as a transgender man it seems more important than ever to explain what that means, what that’s like and how it can be very different than the Jenner experience the public’s been fed in a media frenzy that’s almost made it seem like transitioning is easy with everyone on the other side ready to welcome you. This month, Cianciotto’s own experience will be on two movie screens in Tucson at the Screening Room and the Loft Cinema in Donnie, a short documentary by Anna Augustowska, a UA journalism graduate, who met Cianciotto when both worked at the Invisible Theatre. The documentary was recently named Best Short in the 2015 Independent Film Arizona contest. The film, while only 10 minutes long, gets to the heart of Cianciotto’s incomplete transition, more specifically the challenges he faces to appeal to the Arizona Mediaid insurance policies to cover gender reassignment surgeries. According to The National Center for Transgender Equality, the following states have explicitly banned transgender exclusions in most health plans, including some plans that are not covered under federal law: California, Colorado, Connecticut, the District of Columbia, Illinois, Massachusetts, Nevada, New York, Oregon, Vermont, and Washington. From Augustowska’s point of view, Cianciotto’s story is more important than ever. For those who may not know anyone, or think they don’t know anyone, who is a transgender man or woman, the Jenner story may make it seem like going from Point A to Point B is a lot easier than it really is. Albeit a documentary short, this first time filmmaker is hoping it gives a much needed different story, and maybe, just maybe, can help Cianciotto and others change Arizona’s Medicaid policy to cover gender reassignment surgeries. Cianciotto says his two biggest challenges are literally on his chest. He’s yet to be able to afford the top surgery needed to complete his transition—a surgery Medicaid won’t pay and isn’t covered by most insurance plans. He’s in the process of appealing the state’s decision on his case with a team of Tucson lawyers and the Transgender Legal Defense and Education Fund. If you have money, you have no problems getting the surgeries needed, and when doctors sign on that it’s a medical necessity, then it needs to be covered, Cianciotto says. The diagnosis of those who feel in emotional conflict with their gender and physical body is called gender dysphoria. Until Cianciotto has top surgery done, this remains a challenge. When he goes out with friends, if he’s not wearing a binder across his chest, it can be heart-breaking when people at restaurants and bars, or on the streets, identify him incorrectly. “Having the surgery would better align with how I feel about myself and change peoples’ perceptions,” he says. When he’s misidentified he goes into a depression, sometimes not wanting to leave the apartment he shares with his girlfriend just to take out the trash. Where he’s most at home is on stage and in the theater. On stage when he MC’s Musical Mayhem shows, it’s what he calls an “enlightened version of me.” He wears a binder on stage, and he feels safe there with the audience and performers. Augustowska, who previously worked at Arizona Public Media as a producer and host and now works as a multimedia design specialist in the UA School of Geography, agrees with Cianciotto. 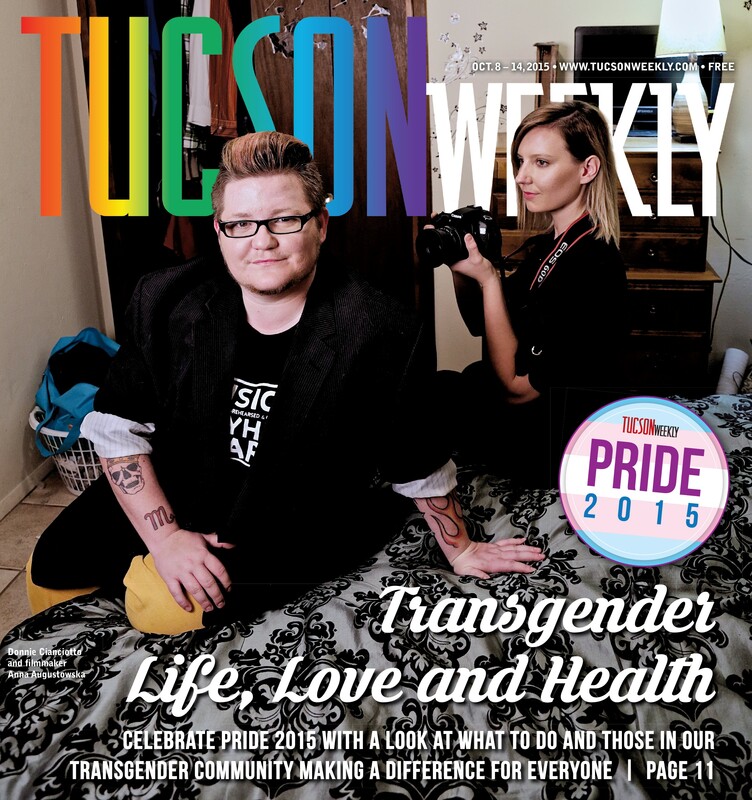 ” I always wanted to make a film about the transgender community in Tucson. It is an open community with messages of acceptance and tolerance,” says Augustowska. During the filming of the documentary, Augustowska says the court decision took place favoring marriage equality. It was a wonderful day full of hope for everyone, even her film subject. “It’s a reflective story. There’s sadness, but that’s not everything,” she says. With a small team, Augustowska shot the footage in June and July, and then took another two months to edit it down to the documentary short length. This is her first documentary, and to be recognized from the start by the Independent Arizona Film contest, and to be featured during the Loft Film Festival is fueling her desire to continue to tell stories in this medium. “It feels amazing and it’s just strengthening all this passion I have for what I love to do—filmmaking and documentary filmmaking. I want to get to the stories that are untold and I want to keep producing more films—small or big,” she says. The next project is a an Arizona story on agriculture and water. She’s already contacted a few farmers and is working out the details before she starts filming. Most likely she’ll do a crowd source campaign to help cover costs. Right now she’s feeling the financial squeeze as she enters Donnie, in film festivals around the country.